The Chinese Shar-Pei has a very stern look on their faces, and it suits their personality as well. Very independent creatures, they enjoy protecting their families and have a keen eye for warding off strangers that may enter their homes. They share the same attitude when engaging with other dogs, but they can be open to getting along well with other pets. They are natural chasers toward other small vermin and bode excellent watchdog capabilities. 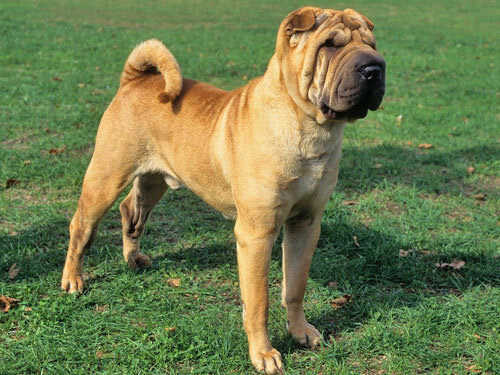 A Chinese Shar-Pei can also back up their protective demeanor and make a great pet that can work as a security canine. Due to their independent nature, they may be a challenge to train even as pups. Someone residing in a home with ample play space in a backyard is the ideal environment for raising a Chinese Shar-Pei. They bode a medium level of energy when compared to other breeds, but being curious dogs, they will need mental play or stimulation as well as a brisk walk on a daily basis. They are not the most playful creatures, making them not the best dog to live with small children. They possess a thick coat of fur that makes playing outdoors even in cold climates a breeze, but they should not reside outside. Their fur coats do not require a lot of grooming, a weekly brushing will suffice. These dogs will however, require a bit of care to keep their wrinkles in the fur clean and dry to avoid any minor irritations. The Chinese Shar-Pei generally does not develop too many health issues which is great news. They can develop CHD and entropion which are both very common in this breed. Some minor health issues are patellar luxation, otitis externa, fold pyodermas in the lips and skin, overactive thyroid glands, allergies and renal amyloidosis. In rare occurrences, megaesphagus has been noted. Screening the vet may recommend for the Chinese Shar-Pei as they age can be for their hips, elbows, knees, thyroid glands and for their eyesight. Some can also develop from time to time fevers due to swollen hocks. The average lifespan for this breed is from eight to ten years long. They generally weigh between forty five to sixty pounds as full grown dogs. The Chinese Shar-Pei has been noted to have lived since the 13th century, with some experts believing they were way before that time period. It is thought that this breed has derived from China and from some form of Chow Chow crossbreeding. They were popular as working dogs on farming lands and have also been known as fighting dogs in the past. They are excellent hunting canines and many find them to be joyful companions for their owners. In the middle of the 19th century, the breed became more common in the United States and is still a common household pet to date. Not generally a show dog, the Chinese Shar-Pei is however, one of the most recognizable dogs with their signature wrinkled skin and facial expressions.